Known for its flawless acoustics, the Beacon has been a favored New York City stop for top acts since the Roaring Twenties. Remarkably, the original sound-system still provides near-perfect acoustics today. 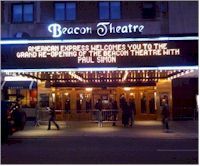 The Beacon Theatre is one of the top New York City venues for concerts and other events. Don't miss some of the biggest names in music as they come to New York City area's Beacon Theatre to perform live.